President Donald Trump on Wednesday vowed that the Second Amendment "will never be repealed" in response to former Supreme Court Justice John Paul Stevens' New York Times op-ed a day earlier. Stevens wrote that the "March For Our Lives" demonstrators should be seeking more effective and lasting reform by "demand[ing] a repeal of the Second Amendment." Trump pushed back and said there needs to be more Republicans in 2018, referencing the midterm elections later this fall, and that they must "always hold the Supreme Court." "THE SECOND AMENDMENT WILL NEVER BE REPEALED! As much as Democrats would like to see this happen, and despite the words yesterday of former Supreme Court Justice Stevens, NO WAY. We need more Republicans in 2018 and must ALWAYS hold the Supreme Court!" Trump tweeted. 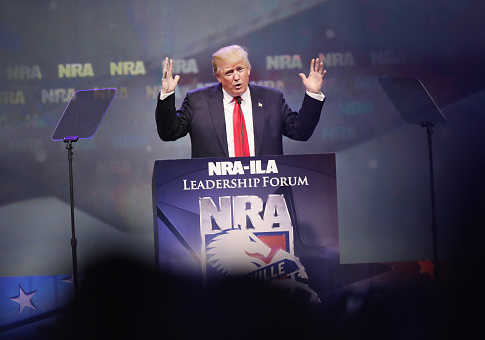 Trump's defense of the Second Amendment comes at a time when gun owners and the National Rifle Association are facing scrutiny from liberals and gun control advocates following the Feb. 14 massacre at Marjory Stoneman Douglas High School in Parkland, Florida. Hundreds of thousands of people participated in the "March For Our Lives" protests across the United States this past weekend, calling for a new ban of certain guns and ammunition magazines. This entry was posted in Politics and tagged 2nd Amendment, Donald Trump, Supreme Court. Bookmark the permalink.